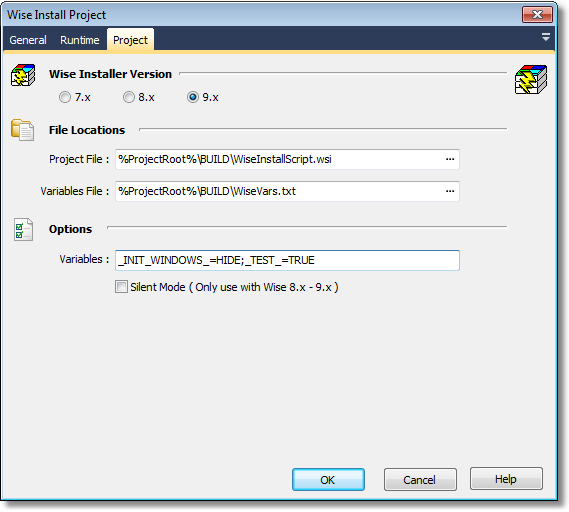 This action provides an interface to Wise InstallMaster/InstallBuilder 7.0, 8.x and 9.x. Later versions work as well, although new features may not be supported. For versions 3.x, 4.x and 5.x, see the Wise For Windows Installer action. Project File : The full path and file name of the wise project file (.wse). Variables File : The full path and file name to a file that contains compiler variables. Format is _VAR_=value, one entry per line. NOTE: The Wise compiler does not return a non zero return code when an error occurs during compilation. This means that FinalBuilder has no way of detecting if the compile of the installer failed or not. Usually Wise displays a message box when an error occurred.